I posted this in August 2008 after a cookie contest. No, I didn't win, but the winner's cookie was most worthy...of course, I couldn't just make it with the pre-packaged refrigerator cookies, but went in search of an improvement. Make a million dollar cookie. Finally today, someone piped up and said there weren't many desserts on the list. Well, Ina's brownies for gazillions sounded like an easy plan...there are few easier recipes that turn out more goodies than that recipe (Outrageous Brownies). 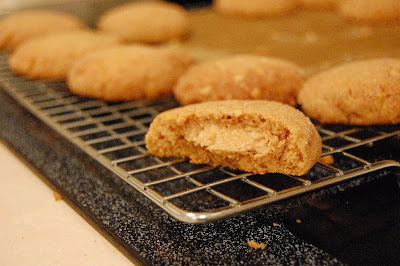 But then, while doing some research for recipes today, I came across mention of the million dollar Pillsbury Bakeoff winner--A peanut butter cookie with a treat inside of it--more gooey peanut butter. Thing is, the winning recipe used refrigerator peanut butter cookies. Not likely, thank you very much. I ended up reading about the cookies by way of Culinate.com, where they suggested doing it one better with their own peanut butter cookie recipe and the Pillsbury approach. Okay. So I made Culinate's peanut butter cookie. Made an inside treat of peanut butter and powdered sugar, wrapped it in the cookie dough, rolled it in sugar, peanuts and cinnamon, then baked. I think my Dorie touch is still working--I only mixed until just blended...the cookies are delicate and delicious with the double whammy of more peanut butter...Hmm. I think maybe I could make this a $1.5 million cookie by adding a chocolate chip or two...or ten. Link up to those recipes (I made the Outrageous Brownies, too...they are really that easy). You don't have to use Culinate's recipe, use your own favorite, but do try the Pillsbury approach. One eaten in blog sacrifice. One goes to school with that lucky little girl, Bryn...and JES Publishing gets the remaining treats...Happy end of summer, all..
Just had to edit to add I tried them again with a chocoate chip inside. Eh. Not enough chocolate, really, but I couldn't add more without making the cookies bigger than they already are. So next time, I'm going to make the inside (the 1/2 cup powdered sugar combined with 1/2 cup peanut butter) out of Nutella instead!!! Oh YUM. Or should that be yummO? cookies are always wonderful!! You repost ALL you need.